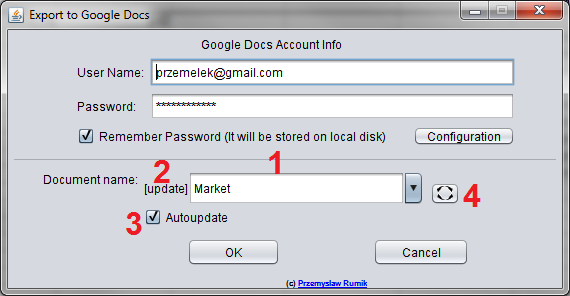 In section "Google Docs Account Info" you may provide your user name and password for your account in Google Docs (if you are using normal Google Docs it will be your GMAIL address, if you are using Google Docs as a part of Google Apps for Domain it will be your address in Google Apps). Checking of checkbox "Remember Password" will cause that OOo2GD will store your user login and password on your computer, thanks to this you will be able to use OOo2GD next time without providing those data. Configuration button lets you to open Configuration window. 2) mode of exporting file, it may be [new] or [update]. Exporting document with [new] will cause creation of new document in Google Docs with name from 1), exporting document with [update] will cause that your exported document will update (stored as new version) document in Google Docs with name from 1). OOo2GD will try to help you and will search for most similar name of exported file and will propose updating of this document, in this case if you don't want to update file you need to change 1). 4) refresh list, this button lets you to refresh list of documents presented in 1).